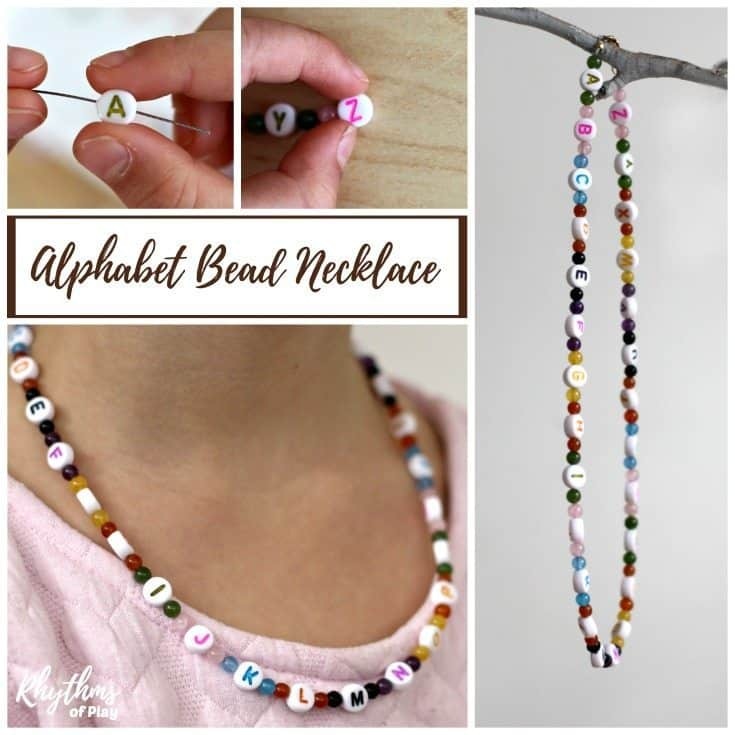 Have the kids make an alphabet necklace to learn the alphabet and prepare to write. Stringing ABC beads is a great way for kids to develop the fine motor muscles in the hand needed for writing. Once finished these necklaces make it easy for kids to have the alphabet on hand whenever they need it. Having the ABC’s around your neck comes in handy when your learning how to read and write! 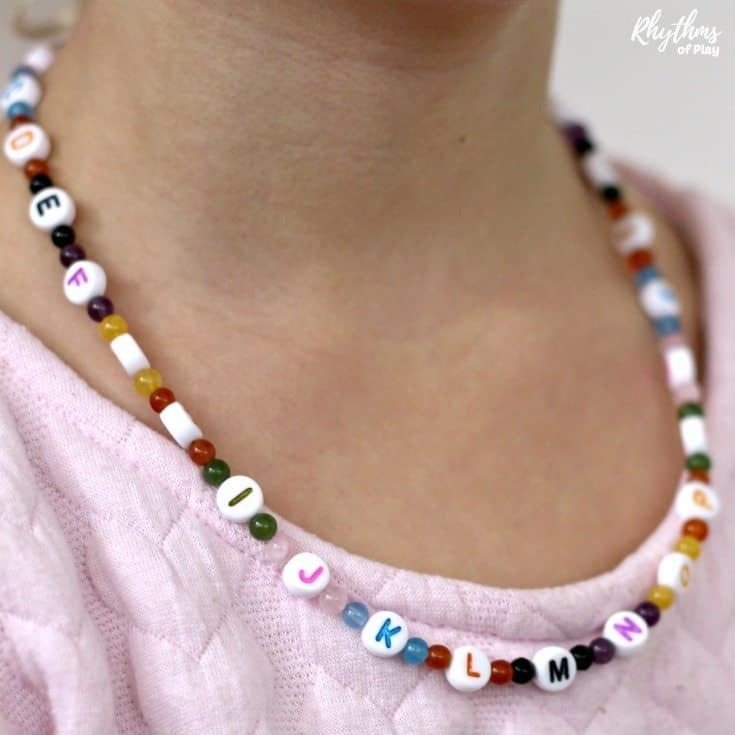 Don’t worry, it’s easy to help your kids make an alphabet bead necklace. Once you know how to start and finish jewelry, you can make almost any bracelet or necklace! Barrel clasps OR lobster clasps and jump rings OR toggle Clasps, ETC. There are three simple ways to start and finish a necklace for this project. Infinity, using crimp beads and pliers, or clamshell knot covers. Click on THIS link for the directions. The materials needed above are also listed with the tutorials. We used 8mm round gemstone beads for this project. 8mm Faceted beads would work just as easily. 10mm round gemstone beads may be better for your child if they have never strung beads before. These multicolored lava-rock gemstone beads come in multiple sizes including 8mm and 10mm as another option. There are a lot more gemstone options and other beads you can use besides gemstones than I have listed below. Most of these links have more than one gemstone option available. Click through to see them all. 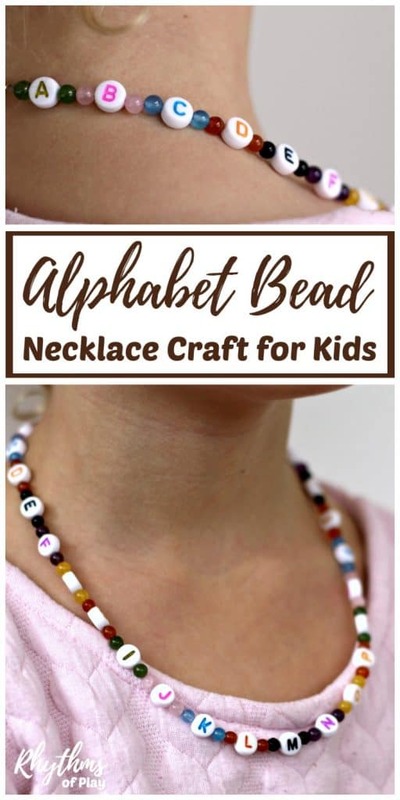 There are tons of different kinds of alphabet beads to use for this alphabet necklace craft for kids. I have placed them in a few categories below to make it easy to find the type you would like to work with. Stringing beads is a great way for kids to practice fine motor skills and develop the fine motor muscles in the hand. Creating patterns, reciting the alphabet as they work, and counting out beads will create even more learning opportunities. Young children will need help starting and finishing their beaded alphabet necklace. There are three simple ways to start and finish a beaded necklace. Click on the link to find all three easy to follow tutorials. Read through the all of the directions below before beginning your beaded alphabet necklace. My daughter loved this easy alphabet activity! She sang the alphabet each time she looked for the next letter to help remember which came next. It was super cute and kept her busy while I got everything else ready. Choose the types of beads and the type of clasp that you would like to use. Use one type or multiple types of beads. Several options are listed above. The type of necklace you design will depend on types of beads and materials that you decide to use. If you are using more than one type or color of bead you will need to decide on the pattern that you will string. Placing beads in patterns on a bead board makes it easy to test ideas. 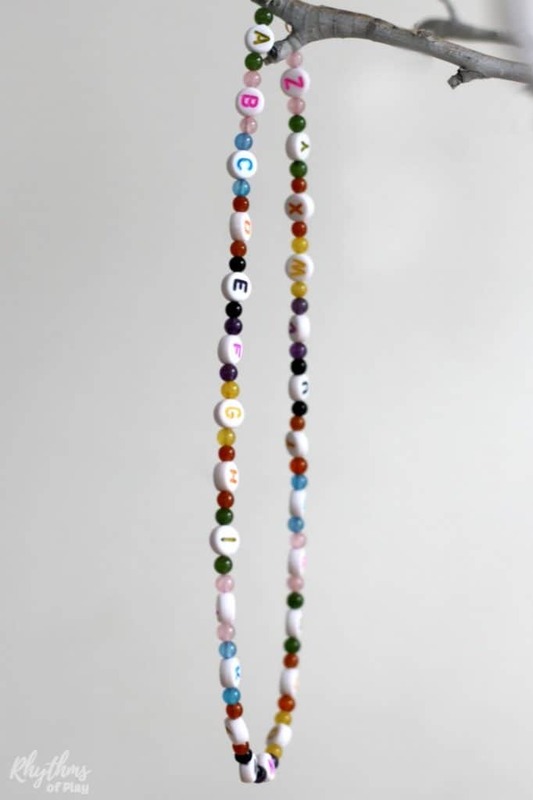 For example, my daughter decided to use round white plastic multi-colored alphabet beads. We worked together to determine the beads to use with them and the pattern that she would follow. I helped her design her own necklace by asking her simple questions about which beads to use and what she liked. She made all the decisions and did all the work, all I did was guide her and assist her in her work when needed. 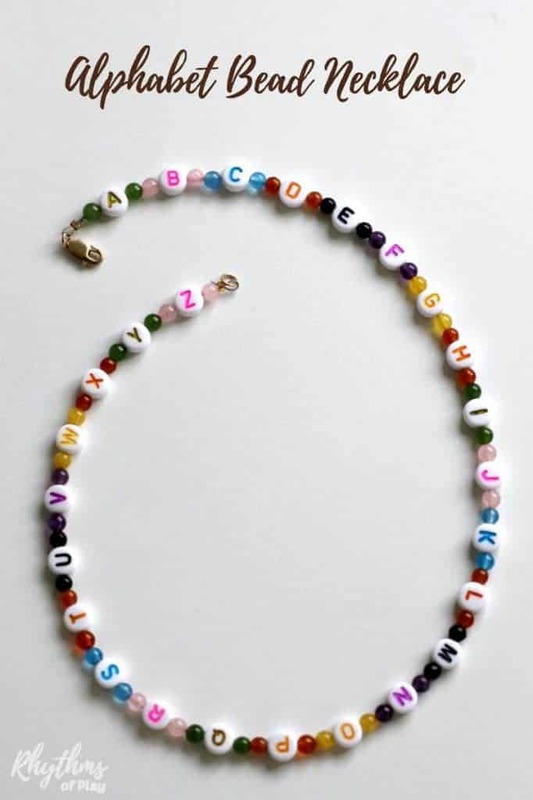 Assist your child with starting their beaded alphabet necklace using one of THESE methods. Keep an eye on your child to make sure they are putting the letters on in the proper direction so they can use their alphabet necklace as a learning tool when it’s finished. Complete the necklace using the same method you started with. Directions for 3 different ways to start and finish necklaces can be found HERE. Once finished these are a great way for kids to wear their A, B, C’s and learn the alphabet. You get the idea. 😉 Make one with the kids today! 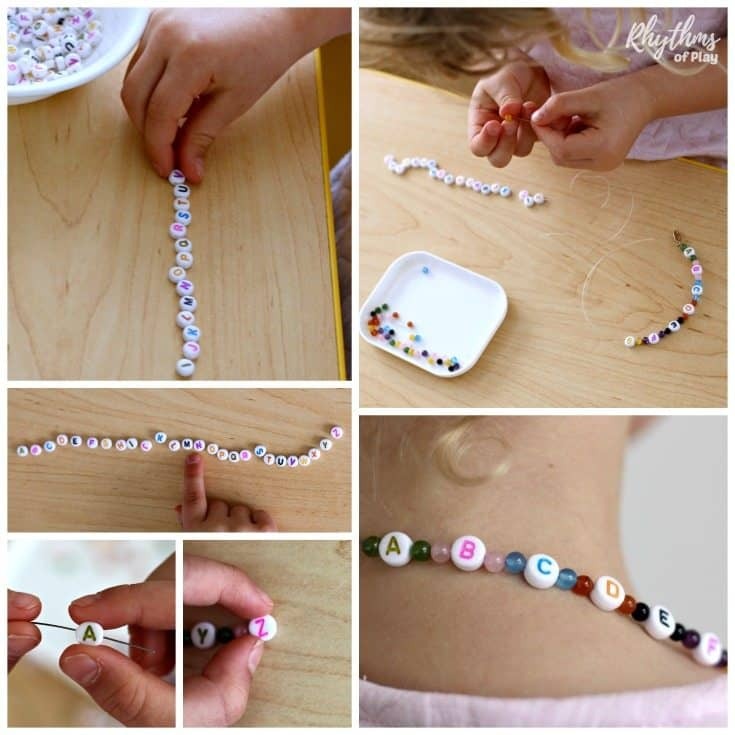 This is really an interesting idea for making a DIY Alphabet bead necklace. This is looking pretty. Thanks a lot for sharing this tutorial.